Royal Caribbean is celebrating the second anniversary of the opening of its office in Brazil this July. To celebrate, Royal Caribbean created a contest in their social media networks, in which participants sent photos of special moments onboard Royal Caribbean ships. The contest had over 2000 participants, which sent almost 10 000 photos. The winning photo was the theme of the campaign to commemorate the company. In these two years, Royal Caribbean was a major player in the growing cruise market in Brazil, brought the largest ship of last season, Mariner of the Seas, and continued investing in the Brazilian market with other ships, Splendour of the Seas and Vision of the Seas. For the 2011/2012 season , Royal Caribbean will try to continue its success, with a new, Splendour of the Seas back completely revitalized with new dining options and more cabins with balconies. The chief executive of the company in Brazil, Ricardo Amaral, was recently announced as the new director for Latin America and the Caribbean, in a move that demonstrates the company's focus on international markets and especially in Brazil. Royal Caribbean has signed a deal with Spanish shipbuilding firm Navantia to revitalize three of its ships in Cadiz, Spain. A delegation of nine people from Royal Caribbean visited the Cadiz shipyard on June 21 and 22 to settle the contract that allow the maintenance and modernization of three ships at dock in the capital. The delegation was led by Revitalization program director, Petteri Keso, as well as the director of fleet maintenance in Europe, Tracy Murrell. Royal Caribbean representatives inspected for two days the Navantia facilities and warehouses, where more than 450 containers come with the equipment necessary to tackle the repairs. Navantia believes they helped sign Royal Caribbean thanks to their experience working on other cruise ships such as Norwegian Jade, NCL America, Milenium, Celebrity Cruises, and the Grand Voyager, the Grand Mistral and Grand Celebration of Iberocruceros. This history has served, among other things, to capture the interest of Royal Caribbean's represenatives. 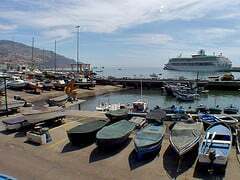 The represenatives from Royal Caribbean have also confirmed the first ship to enter the Cadiz shipyard will be Splendour of the Seas to recieve major repairs and modernization. Splendour will arrive in November to undergo a modernization plan that includes the habitability of the ship, "which will be completely renovated." Royal Caribbean has also reserved time for the repair of two other ships, which will undergo a revitalization plan. Then in May 2012 Grandeur of the Seas will enter the dock followed by Serenade of the Seas in November. Royal Caribbean's Splendour of the Seas has been servicing Brazil for years but before it returns to the South American nation for the 2011-2012 cruise season, it will get some upgrades. Royal Caribbean corporate manager, Alex Calabria says at the end of the summer European season, the Splendor will undergo a comprehensive refurbishment before returning to Brazil. The ship will gain new lounges, nurseries and wi-fi access. In addition there will be three new restaurants, Giovane Stable, Park Cafe and a Japanese food restaurant. "An entire floor of outside cabins will be redone with balcony staterooms and have the second store on board the Romero Britto. Will ship to the taste of the Brazilian public," Calabria said. Royal Caribbean is promoting a road show in five towns in São Paulo, Brazil this week to spread the news for the 2011/2012 cruise season. One of the novelties introduced is the Splendour of the Seas, which went through a revitalization and will be in Brazil starting on December 11. The road show has gone through Bauru, Sao Jose do Rio Preto and Ribeirao Preto. Today (May 4) it will be held in Sao Jose dos Campos at 7:30pm, and then at Blue Tree Power. Tomorrow (May 5), it will be promoted in Campinas, from 7:30pm at the headquarters of Anchorage. A positive start to the season for Splendour of the Seas, her first year season cruising from Venice and she is ready to go. 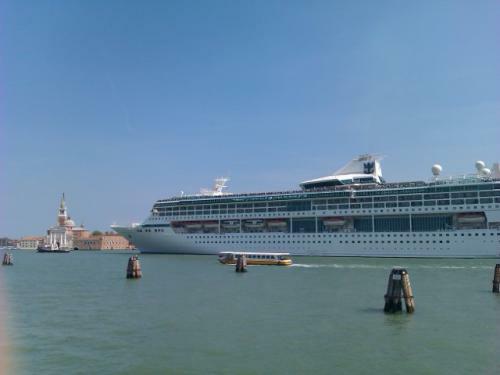 Splendour of the Seas is the first ship of Royal Caribbean's fleet to dock at the port of Venice in 2011 and opened a major new cruise season for the brand. At Movimenterà alone, nearly 60,000 passengers embarked from the port of Venice 29 times for 10 and 11-night cruises to Greece and Croatia until November 2011. Voyager of the Seas arrives on May 21, Brilliance of the Seas May 25. From April to November, there will be seven ships of Royal Caribbean that pass through the capital of Veneto, for a total of 113 airports and handling over 320,000 passengers. "Year after year, Venice increasingly consolidates its leading role in planning for Royal Caribbean - says Lina Mazucco, CEO Cruises Ltd RCL Italy -. 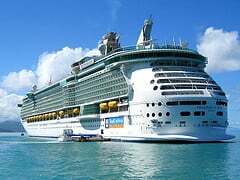 2011 in particular will be a golden year for the former Maritime Republic, which will nearly double the flow of Royal Caribbean cruise: from about 170,000 last year, we expect to reach over 320,000 this year. " Royal Caribbean's Freedom of the Seas has completed a series of upgrades it received at the Grand Bahama Shipyard. Freedom will return to service this week with a slew of new changes to the ship. The upgrades, part of Royal Caribbean's Royal Advantage program, invested $70 million in ship upgrades to help keep Freedom and other Royal Caribbean ships more appealing to consumers with newer and bigger ships coming online. Royal Caribbean vice president of hotel operations Lisa Bauer thinks the upgrades to Freedom of the Seas will make a difference based on what they've seen for Liberty of the Seas, “The outdoor video screen installed aboard Liberty of the Seas in January has already been so well received that we have decided to deploy it aboard all the ships scheduled to undergo the Royal Advantage revitalization in 2011." As of today, Freedom of the Seas and Liberty of the Seas have finished their upgrades with Radiance of the Seas set to be changed in May and Splendour of the Seas in October. Two more ships in Royal Caribbean's fleet will receive upgrades in 2011. Radiance of the Seas and Splendour of the Seas will receive ship wide enhancements. Radiance of the Seas will enter dry dock in mid-2011 and will add a Samba Grill Brazilian Steakhouse as well as a Mexican-themed restaurant caled Rita's Cantina. Both restaurants will debut on Allure of the Seas later this month. In addition, Radiance will get a new Diamond Lounge for Crown & Anchor Society loyalty program members, a Royal Babies and Tots Nursery, interactive flat-panel televisions in all cabins, and wireless Internet throughout the ship. Splendour of the Seas will recieve the same upgrades that Radiance has, which includes the two new specialty restaurants, the Royal Babies and Tots Nursery, a new Diamond and Concierge Lounge, flat-panel televisions in every cabin, and wireless Internet throughout the ship, as well as adding new balcony cabins to Splendour of the Seas and also enhance select cabins and public areas, including the Windjammer Marketplace.